The Chart tab displays the visual representation of your data. 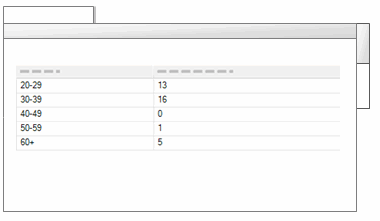 The Summary tab displays data values that were used to generate the chart. On the Explore tab, in the Charts group, click the Chart image. Follow the steps in the Wizard, and then click Finish. You can use the options on the Chart tab to change the appearance of your chart. Coding for a file Shows coding information for a particular file. You can see which nodes are most used to code a file—for example, the file Competing water uses is most coded by the node Economy. You can also see how much coding is done on a file and which users coded the file. Coding by attribute value for a file Shows how a particular file is coded against one or two classified case attributes and their corresponding combinations of attribute values. This can help you see which demographic groups are most/least represented in cases that code a specific file—for example, Interview about Coastal Flooding is least coded by nodes representing males aged over 50. Coding by attribute value for multiple files Shows multiple files as coded against a particular classified case attribute and its set of attribute values. This can help you determine which demographic groups are most/least represented in cases that code a range of files—for example, Discussion Group 1 is coded mostly at cases representing participants under 40 years old, while Discussion Group 2 is coded mostly at cases representing participants over 50. Coding for a node Shows how a particular node is used in coding files. This can help you see which files are most or least coded at a node—for example, the node Habitat has more coding references from the file Interview with Barbara than from any other file. You can also display the users that did the coding. Coding by attribute value for multiple nodes Shows multiple nodes matched against a particular classified case attribute and its set of attribute values. This can help you determine which demographic groups have been coded most or least at a set of nodes—for example, residents from Bayview are most concerned about land reclamation, while residents from Riverside are most concerned about flood control. Files by attribute value for an attribute Shows the number of files that match each value for a particular attribute. This can help you see the range of journal articles or other files in your project—for example, the year of publication. Files by attribute value for two attributes Shows the number of files that match various combinations of two attributes. This can help you see the range of journal articles or other files in your project—for example, year of publication and journal. Nodes by attribute value for an attribute Shows the number of cases that match each value for a particular attribute. 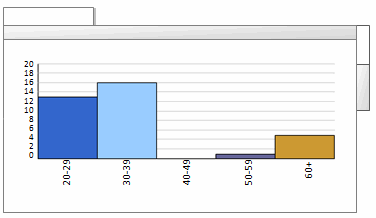 This can help you see the demographic spread of your survey participants by a single attribute—for example age group. NVivo provides a range of chart types—the available chart types vary depending on the data you have chosen to view in the chart. Bar charts are useful when comparing quantity or analyzing an increasing/decreasing trend. Column charts are useful when comparing quantity or analyzing an increasing/decreasing trend. Pie charts effectively show the proportion of different parts that make up a whole. Bubble charts show varying density of data when comparing combinations of variables. Heat maps show varying density of data when comparing combinations of variables or matrices. Radar effectively displays direction or trend when comparing several variables.